Click to listen to episode (3:24). From the Cumberland Gap to the Atlantic Ocean, this is Virginia Water Radio for the week of February 4, 2013. This week, we feature another mystery sound. Have a listen for about 20 seconds, and see if you can guess where these people are. And here’s a hint—they’re part of a Virginia process dating back to 1619. If you guessed the Virginia General Assembly, you’re right! Those were sounds from the January 31, 2013, meeting of the Senate committee on Agriculture, Conservation and Natural Resources, or ACNR. With over 2000 bills introduced every year, standing committees—11 in the Senate and 14 in the House of Delegates—are the key points where bills are sorted, debated, and then either advanced or stopped. Many water-related bills go to the Senate ACNR or to the House Agriculture, Chesapeake and Natural Resources committee. For example, on January 31, the Senate ACNR was considering bills on dams, uranium mining, wetlands, and recreational boating rights on freshwater streams. Let’s listen to a one-minute sample of that committee’s action on Senate Bill 737, the stream boating bill. The Virginia General Assembly has been in business since the first meeting of the House of Burgesses in 1619, and committees are where much of that business gets done. 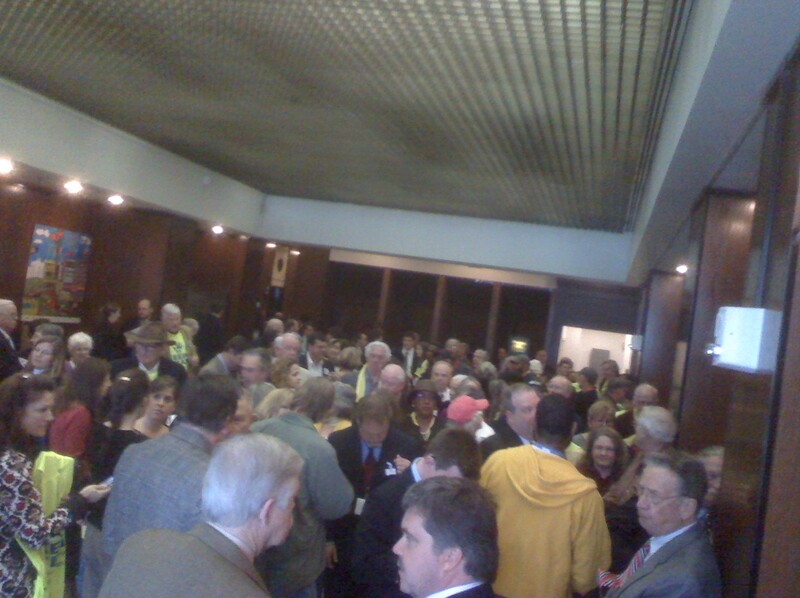 At the Virginia General Assembly building on January 31, 2013, citizens interested in Senate Bill 1353, regarding uranium-mining, wait for the Senate Agriculture, Conservation and Natural Resource Committee meeting where that bill was on the agenda. Acknowledgments, sources, and more information: All sounds were recorded by Virginia Water Radio at the General Assembly Building in Richmond before and during the January 31, 2013, meeting of the Virginia Senate’s Agriculture, Conservation and Natural Resources Committee (Senate ACNR). Senate Bill 1280, mentioned in the audio, concerned enclosures for foxes and coyotes used in connection with hunting dogs; between 100 and 200 citizens attended the portion of the committee meeting concerning that bill. Speakers heard during the committee-debate segment of the audio (in order of being first heard) were Sen. Mark Obenshain (R-26th District); Sen. J. Chapman Petersen (D-34th District), the chief patron of SB 737 (that is, the person who introduced the bill); Sen. Emmett Hanger (R-24th District), the chair of the Senate ACNR; and the clerk of the committee. A 3 minute/43 second recording of the Senate ACNR’s action on January 31 on a bill concerning uranium mining (SB 1353) is posted on the Virginia Water Central News Grouper; please see this link: Water in the 2013 Virginia General Assembly: Senate Uranium Mining Bills Withdrawn in Committee Actions on January 31. Online information about committees and other aspects of the General Assembly is available at the Legislative Information System Web site, at http://lis.virginia.gov/lis.htm. The General Assembly’s Web site is http://virginiageneralassembly.gov/. Virginia residents can also contact the offices of their respective General Assembly members for more information. If you don’t know your representatives or their contact information, you can use the online “Who’s My Legislator” service, available at http://conview.state.va.us/whosmy.nsf/main?openform. You can find members’ contact information at these links: House of Delegates: http://dela.state.va.us/dela/MemBios.nsf/MWebsiteTL?OpenView; Senate: http://apps.lis.virginia.gov/sfb1/Senate/TelephoneList.aspx. If you know the numbers of your House of Senate legislative district, you can also use the following code to identify your representatives’ Capitol phone numbers: for delegates, (804) 698-10 + district number (for example, 698-1003 for the District 3 delegate); for senators, (804) 698-75 + district number (for example, 698-7510 for the District 10 senator).